St. Martin's Press, 9781250024954, 291pp. As in his acclaimed book Blackhorse Riders, a finalist for the prestigious Colby Award, Philip Keith uncovers a harrowing true story of bravery and sacrifice by the men who fought valiantly to hold FSB Illingworth-a tale never-before-told and one that will not be soon forgotten. 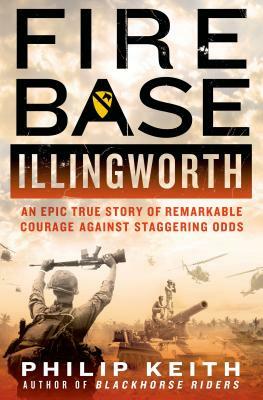 "In relating the events at Fire Base Illingworth, Phil Keith has captured the essence of combat from first hand accounts of those soldiers who experienced it. The reader can sense the fear, the confusion, the bravery which hung over these men on that awful day in 1970, and which continue to haunt many of them to this day. Fire Base Illingworth can rightly take its place alongside such Vietnam War classics as Fields of Fire and We Were Soldiers Once and Young." "A wonderful tribute to Jack Illingworth—and for all men and women who died or spilled blood in the Vietnam War. Phil Keith has done an outstanding job of researching and then recounting the heroic efforts of the ingenuity and adapting to conditions that were unforeseen or unpredictable in the "Vietnamization of the war." No matter what the grand strategy is of any conflict, it always comes down to the individual and the way individuals function and are lead. A vivid picture of how leadership is able to shape and determine victory from the inside out—this is a spectacular work that is made from the rich fabric of human brilliance (on both sides) stitched together in the way only a master storyteller can do. A must-read for anyone wanting to better understand Vietnam and how things really were on the ground—and how we ultimately left without victory." "An incredible story—one in which high command deliberately sets as bait deep inside enemy territory near the Cambodian border an undermanned and inadequately fortified fire base composed of a lash-up of disparate units that had never before worked together. The result was a twentieth century Alamo waiting to happen. Philip Keith's meticulous research and powerful narrative skills are at their peak in this extraordinary story of horror and heroism in the jungles of Vietnam—a story I could not put down until I had finished it."